Tonight I sat among 1000 or so. A crowd of fans, followers, and faith-filled people. We gathered to remember, to let loose, to grow…and to dance a bit too. I think one of the first concerts I ever attended was a Steven Curtis Chapman one, back in the day, in the early 90’s. Anyway, tonight, darling daughter, my sis-in-law and I volunteered at the concert with Show Hope. As I looked at the crowded Show Hope table, filled with beautiful colorful faces on the sponsorship packets, there was one that stood out from the rest…there nestled in the sea of faces; our son. I was a proud mama tonight as we passed out sponsorship brochures before intermission. “That’s my son”, I exclaimed as I extended my hand to those who raised theirs- willing to be extended and give because of God’s doing. 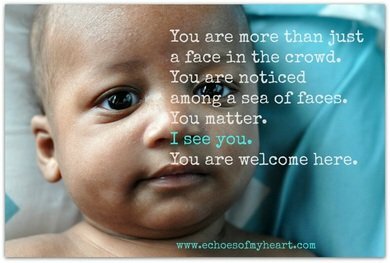 Sheer gratitude and a desire for more children to come home to their forever families…what a privilege! We are so grateful to Show Hope for helping us bring our son home. He is not just a face in the crowd, he is our son. He belongs to our family…and we pray he becomes a part of God’s family one day too. You may feel like you are just blending in tonight, but guess what? There is great news! God sees you and He knows you. He formed your very heart. Your life is like no other. You belong. YOU are welcome here…through Jesus, a life like no other, given, so that you can truly live and truly know love. His arms spread wide, are never too crowded for YOU. For more information on orphan care or adoption, head on over to Show Hope or How to Adopt. « Just Right, Just Write. Thank you for your words tonight. Beautiful picture of God’s love for us. Your words have encouraged me more than I can express. As a blogger it is hard to not feel like you are blending in. Thank you for reminding me that God see me. Blessings. Hi Katie! I’m an adoptive mama of 3 and we sponsor a sweet girl named Sunday. Oh how myth heart is filled for those waiting to be chosen. Love this post and sang the songs right along with you. Huge SCC fan. Have a great weekend! Beautifully written, Katie! Isn’t it wonderful to know that He sees each of us and loves us uniquely? Thanks for you post! I knew I’d find encouragement and a lift in my step here. You have a way of doing that, friend! Thank you! You make a difference in the lives of many, including mine. We can never hear or read too much that we belong! Sending hugs your way. Oh Mom, you are amazing! I love the pics you used! You are the BEST mom ever! I <3 u! Love Your daughter- Brooklyn.